After Santa Cruz: Another Gobnait Day. Yesterday when Joan was showing me Gobnait's Well in Ballyvourney, I asked her if that was a common Irish name these days. She said yes, and that she has a friend named Gobnait. I know what you're thinking: Feminist Revolutionary, hmm? But was she a lesbian? Yes, that's what I wondered too. Who ever knows with these women? She seems to be the kind of zealot that I well know and love. A person who knew so clearly that at one time, long ago, when the revolution was new and the battle lines were clear, who was who. When there were Them, and Us, and the difference self-evident. She came from the ruling class, and became independently wealthy in 1909, at the age of 48. Until then she had worked as a nurse. She bought a few acres down the road from us in Westcove. She built a hospital and an agricultural co-op. Neither British government, nor the Irish government ever gave her license to open the hospital, so it sat empty, until it became a ruin. She supported the Easter Rising, and after the War of Independence supported the Anti-treaty side, which was the De Valera side, not the Michael Collins side, of the Civil War. This was the side without compromise. She eventually quit her political party and the women's party because they were not radical enough. 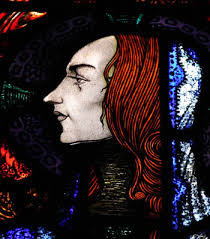 Gobnait took her Irish name as an adult, inspired by the St. Gobnait of Ballyvourney, the abbess I met yesterday. When she died in 1955 at the age of 93 (never married) her will left her remaining £17,000 to "to republicans “as they were in the years 1919 to 1921." How so many of us wish we could leave our fortune to ourselves as were when we were young. But as we age, do we ever find the new generation of revolutionaries as pure as we were when we were young? Decades after she died, a judge found that the behest could not be made to anyone because it was too vague. All this information and more is in this article about her published by the Staigue Fort House B&B&B near the ruins of her hospital. We will visit there soon. Another place we will visit when we can is the Honan Chapel at University College Cork, the greatest flowering of Arts and Craft's glass and mosaic is there for anyone to just walk up and be transported by. One of the windows depicts St. Gobnait whose well, home, tomb, and Sheela na Gig I visited yesterday. When I return to that chapel sometime this summer I will post about it. Meanwhile, here are some pictures. Linda - I'm reading or re-reading these in order now - very much enjoying them. Why wouldn't the Irish govt give her a license for the hospital? Was she too radical for them to work with? I've asked around and there is no definitive answer. Neither the British nor the Irish government wanted her hospital. There still is no hospital out here, the nearest one is in Bantry, which is far away. So maybe there is a formula that determines which regions get hospitals, and there's nothing to do with her politics. 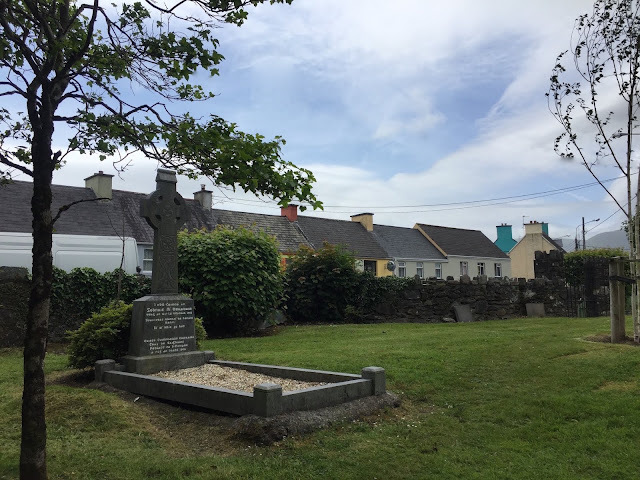 I'm working on another post about her, because I discovered a museum exhibit in Sneem that has more information than anywhere else. But no answer to this question.